What would you want in your perfect hotel? What about a grand location, sumptuous apartments, faultless service and a restaurant acknowledged as one of the finest in the world? 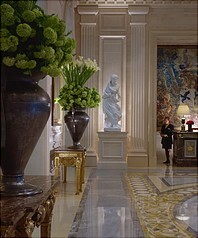 I have recently spent a few nights at the Four Seasons George V in Paris, and I have to report that it as near perfection as we have any right to expect this side of the Pearly Gates. Once inside, all is pristine, elegant and spacious. And bedecked with ravishing flower arrangements. Indeed, if your branch of the Women’s Institute is looking for a destination for a special outing, seek no further. 14,000 blooms arrive at the George V each week from Holland – to be turned into spectacular designs by Jeff Leatham and his team. I know of no other hotel anywhere with such delightful floral decoration. These efforts make wandering round the public areas a real pleasure. Not that you will be keen to leave your own private apartment, for it, too, will be a gem of good taste. I could happily have lived in room number 500, on the fifth floor, for a few years. This was exactly what I like in a suite: a convenient arrangement, lots of space and impeccable style. From the large hallway were doors to the cloakroom, the kitchen (and thence into the eating end of the drawing room) and the bedroom, and a corridor to the middle of the drawing room. Underfoot was parquet flooring of light oak. All around were evidences of no-expense-spared quality. In the drawing room four French windows, each with swagged and tailed curtains in white silk brocade, gave onto a balustraded balcony overlooking the avenue George V. Fauteuils upholstered in green silk, a mahogany dining table for six, crystal chandeliers, Aubusson and needlepoint carpets, dimmable crystal chandeliers, pieces of decorative porcelain, decent 18th century oil paintings, items of good reproduction furniture in the Louis XVI style with ormolu mounts – this was my sort of room. I put Debussy on the cd – and ’twas very heaven. In the bedroom were divinely comfortable beds, cream carpeting and mauve tulips (for the flowers adorn all parts of the hotel). And the bathroom was everything it should have been at a top-class establishment, with walls of beige marble, floors of green marble, Bulgari toiletries, two wash basins, a separate loo, a separate shower and fluffy bath towels 5 feet 6 inches long. Only one feature jarred: a bath tub which was wide and deep, but too short. The room service and housekeeping were both faultless. And, if you are willing to entrust your footwear to others overnight (personally, I like polishing my beautiful brogues myself, but folk tell me I am odd), you will find your shoes outside your door in the morning – wrapped in tissue on a wicker tray. All in all, I judged £1,450 a night for this wonderful suite in the centre of Paris excellent value. There are certainly hotels at which you will pay more for much less space and much less quality. And then there is the restaurant. And what a restaurant… I arrived two days after it had been announced that the Michelin inspectors had awarded Le Cinq its third star. In the culinary world, this is the Oscar of Oscars, the accolade of which all serious chefs dream. My dinner from chef Philippe Legendre’s kitchen demonstrated that the Michelin paean of praise is fully deserved. A fricassé of langoustine with a coriander emulsion and lasagne with Parmesan was quite brilliantly done, a breathtaking balance of subtle tastes. Then a plate of sheer indulgence: a whole black truffle, partnered by a slice of foie gras, hidden within a case of puff pastry; the waiter removed the top and poured into the case several spoonfuls of sauce Régence, a blending of truffle and foie gras. A sublime paradox: a harmony of qualities both extravert and discreet. Next, roasted pigeon with dates, candied lemon and cumin sauce – the flesh red, tender and full of flavour (although, in my judgement, the couscous in a separate dish was a distracting irrelevance). And a sparkling and refreshing finale: a frozen, almost candied tangerine, with chestnuts from Collobière. These four courses from the carte cost £140, not a fortune for a meal of such surpassing excellence, but a 5 course set meal is available at £60. Nor need your drinking break the bank, with a white burgundy available for as little as £20. The gems naturally cost a little more – 1959 Romanée-Conti is £4,600 and 1961 Margaux is £1,650. For, as you would expect, there is a great cellar here. And there are some great sommeliers to guide you among its treasures. I last saw Eric Beaumard when he was at La Poularde at Montron-les-Bains and had just won the silver medal at The World’s Best Sommelier championship. From his marvellous list I enjoyed a beautifully made, full-bodied, toasty, nutty and complex 1999 Meursault (J.M. Boillot - £50) and a hot, tannic Gevrey-Chambertin, full of red fruit (Dom. Sérafin, Vieilles Vignes, 1997 - £60). But outshining both these was one of the glorious, low alcohol (7.5%) eisweins from the Nahe, produced by Herman Dönnhof (2000 - £125, half) – demonstrating how thrilling can be a perfect tension between acidity and sweetness. To drink this with my pudding was a real privilege. It is a tribute to Monsieur Beaumard’s catholic taste that he includes such German marvels (and those from many other parts of the world) in the cellar of this glorious Parisian restaurant. Any table in this large classical chamber will afford pleasure, as you gaze about at the palm trees, the pilasters with rams’ head capitals, the gilt candlesticks and the extravagant flower arrangements. But two tables I would commend to you: number one and number 19. These are by the wall and have sofas in buttoned velour. I sat at number one and loved the view across the room, through the French windows, across the courtyard, into the entrance hallway and out onto the avenue George V.
The Four Seasons George V in Paris has recently been voted the Best Hotel In The World by the readers of a magazine. Normally, I take no notice of such exercises. But, for once, I think the voters might have a point… So, what would you want in your perfect hotel? And while you are in the French capital at this Art Déco hotel, I suggest you make time to view an exquisite Art Déco staircase close to the avenue de l’Opéra. Made of wrought iron in 1930 by Emile Ruhlmann, it is the chief adornment of the Restaurant Drouant in the place Gaillon. I also suggest that your viewing is done over dinner, for chef Louis Grondard’s traditional French cuisine is deeply satisfying. Rodin and Renoir used to eat here in the 1880s, but in those days Monsieur Drouant’s establishment was but a modest bistrot. Nowadays it is a temple of luxury, a place in which the wax of candles trickles onto silver candelabra and those with deep pockets can easily spend over a thousand pounds for a bottle of great French wine (although a white from Cassis can be had for £17). Assistant sommelier Cyrille Menard brought me a distinguished 1998 Puligny Montrachet (Garenne, Boillot - £68), full-bodied, luscious and toasty, and a fascinating red, a 1998 Premières Côtes de Bordeaux, Château Carignan. Made of 75% merlot and 25% cabernet, this is a massive beast, which will need quite a few years before its intense fruit settles down (£100). I ate scallops, served in their shells with melted butter, a refreshing truffle salad, roasted lamb and – as a most satisfying conclusion – roasted bananas with coconut cream (£105 for these four courses). The judges of the famous literary prize, Le Prix Goncourt, meet at Drouant each year for lunch, so that they can make their final decision on a full stomach. Fortunate people. And Paris is a fortunate city, to have the George V and Drouant. Place Gaillon, 75002 Paris, France.